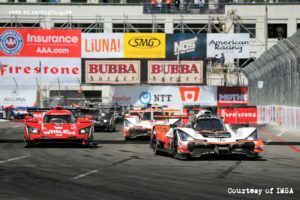 IMSA delivered a good race in Long Beach. What was amazing was how calm the race was overall. 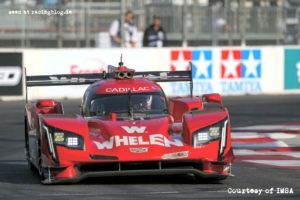 The Acura Team Penske led from pole position with Helio Castroneves in the # 7, while the # 5 Action Express Racing Cadillac DPi with Joao Barbosa and Filipe Albuquerque was passed back at the start. But over 100 minutes later, the world looked quite different again. The drama for car # 5 began in the opening round as the field stacked in turn 1. Barbosa dropped from fourth to eighth place after avoiding the chaos around him. After Albuquerque was installed in the car, the No. 5 began to get back lost ground. But then again there was trouble, as a creeping plaque foot on the right front tire required an early final pit stop. Under intense pressure from Castroneves' team-mate Ricky Taylor in the final sprint to the checkered flag, Albuquerque kept the Cadillac up front. The worn tires of the Cadillac allowed the Acura to stick at centimeter distance below the rear wing. Traffic on the last lap sealed the impressive day for Team # 5. The actually favored Mazda on the other hand had a tough day. The # 55 had to pit in between with minor technical problems, the # 77 never had the speed to compromise both Acura and the Action Express. In the end, a fourth place remained. Things were really bad for the Whelen team in # 31. At first they fought for the lead and had good chances for the overall victory. But then the pit stop was assembled because the front right tire was not tightened and became self-sufficient. Surprisingly enough, they stayed in the lead, but then they had nothing to do with the win. GTLM was a thing of Porsche. Both Porsche stood in the front row at the start and led the field through the start phase. 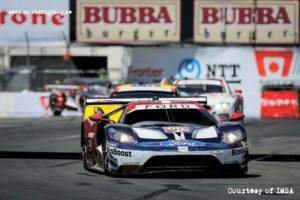 The 66 Ford GT threatened to spoil the Porsche party, as Sebastien Bourdais completed the compulsory stop much earlier. Dirk Muller took the lead after the rest of the GTLM class had stopped. It came to a three-way fight at the top, which Earl Bamber cleverly used to take the lead. However, he got a blow to the # 912's diffuser, which dangled and fluttered to the end. Bamber later said that the beating diffuser was causing serious problems because it also damaged the exhaust. But Bamber saved the battered Porsche in first place in the finish. Behind Bamber, the # 66 Ford seemed to be in second position, though behind it both Corvette were stuck. Muller in Ford could keep the Corvette at bay, but then came the last lap and retaliated the fact that the Ford stopped just earlier. In turn 8, about 1 kilometer from the finish, Muller ran out of fuel. Magnussen, who hung in the Ford's diffuser, then pushed the Ford aside, as he admitted after the race. He feared that it would otherwise come to a chain reaction with his teammate. The Ford crashed into the nearby wall with an amazing amount of force, but Muller was uninjured. It continues with the IMSA on the third of May in Mid-Ohio, where again all classes will be at the start.